Surviving the Zombie Plague. Is There an App for That? Colson Whitehead’s Zone One consistently has been described as a “smart zombie thriller.” Having recently become a fan of zombie scenarios (via, AMC’s “The Walking Dead,” of course), and possessing a desire to read something that would take the sticky, boring sweetness out of December, I read the book over the Christmas holidays. Whitehead has a way of making even words I do know and love somewhat mystifying, and beautiful. If you haven’t caught on by now, this is a book about the apocalypse arriving in New York, specifically downtown Manhattan. Which is why, I, reluctant New Yorker, couldn’t wait to read it. Thankfully, Whitehead does not lean on New York’s one brief real-world glimpse into the nightmare — 9/11 — to terrify his readers, except perhaps his references to everyone having PASD (post-apocalypse stress disorder, naturally), especially the antagonist’s tendency to hallucinate that ash is always falling on him, which is chalked up to the ever-working incinerators torching the bullet-ridden “skels,” belching their desiccated byproduct over the city. With each of his hallucinations, I too saw visions of dust-covered New Yorkers from a decade ago. Yeah, heavy. Since I am not an apocalypse aficionado, I can’t tell you what new details Whitehead dreamed up, and which he is merely rehashing from the genre, or borrowing from real-life, 9/11-like events. But the level of detail is stunning — you feel the lonely agony of the few who remain, their feeble attempts to feel normal while sleeping in trees, their terror at the sound of uneven footsteps that might indicate a rabid pack of skels stirring to life. Beyond the vivid “I’m scared of the skel” moments – and I found myself wanting a lot more direct zombie encounters, by the way, though the sloppy grand finale was great — what really resonated with me was Whitehead’s sly insertion of commentary on the absurd way we live these days, and the implication that many of us would be extremely inequipped to deal with a doomsday event, despite our college degrees, Pilates-toned bodies and smartphones. And the book feels very timely – after all, Ivy League schools have been over-charging foolish attendees for generations – but only recently have we begun to shift our lives online, and we’ve done so with very little analysis of the end point. This is something “The Walking Dead” mostly fails to address, with its cast of sharpshooter cops, animal tracking expert rednecks and hardy housewives. It’s too easy to imagine those people surviving into the new world, calmly shooting down the infected, but what about the general lot of us? While my grandparents and previous generations – who could farm, sew, split wood and can food with the best of them – might have fared pretty well in a post-apocalyptic world, even without any special warrior skills, this book was a great reminder that I’ve got a steep learning curve, because I’ve spent most of my adult life chewing on my tail, comfy and neurotic, taking things for granted. And, likely so have you. This book won’t let you forget that. Zone One joins the roster of books, TV shows and movies stoking the renewed interest in apocalyptic scenarios, which many assume is driven by the dire state of the world. But, I also suspect some of that interest stems from our collective anxiety about how quickly humankind has lost essential survival skills, and that fact — coupled with the predictable mayhem that a worldwide plague or bomb or whatever might wreak — is what is keeping us up at night, feverishly devouring books like this, convinced they might better equip us when the brain eaters (four horsemen, nuclear wave) are nigh. 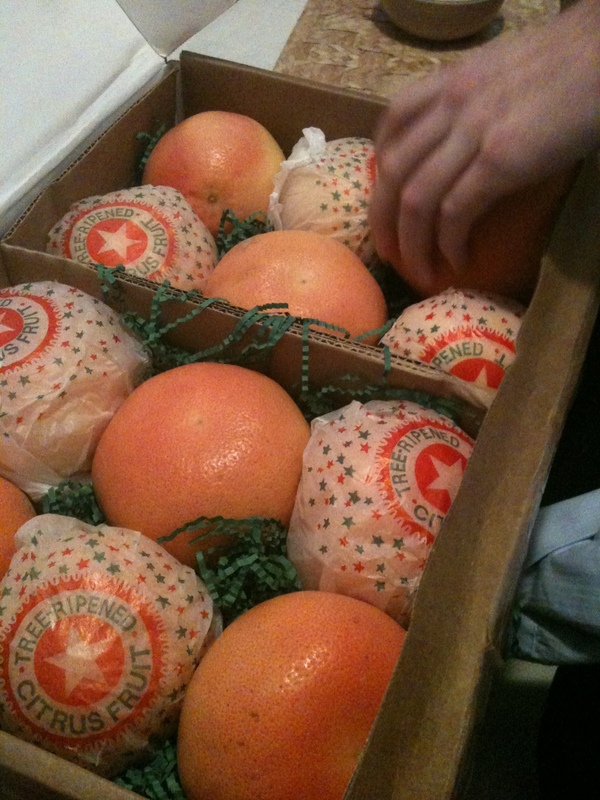 It doesn’t feel like Christmas until I can rip into one of these sweet, juicy gifts from heaven. Thanks to Aunt Martha for shipping me some! 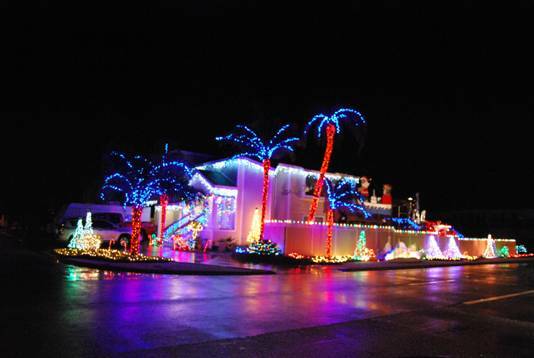 My Dad sent me this photo after they went to go look at Christmas lights. You certainly don’t see anything like this when you live in the Northeast. And yes, those lights are reflecting off a rainy sidewalk – the prolonged drought is easing, and my parents even have a winter garden going strong, with radishes, lettuce and other greens. Pretty amazing.